Before looking at examples of ideas for community art projects and events, it is important to establish the importance of art in a community and how art affects a community. Why is public art important to the community? Art in public spaces and communities helps reflect what makes that particular town unique. By showcasing art by local artists, or art made by artists with the purpose of capturing a town’s heartbeat, a town can experience positive changes in culture, economy, and community. How does art affect a community? Art provides a platform for encouraging change, documenting reality, sharing thoughts, and inspiring creativity. Art can affect a community in a number of ways when used strategically like improving the economy, boosting community morale, exploring nature, bridging generational gaps, and embracing learning. It is a win-win-win when an event can simultaneously boost sales for local businesses, bring more awareness to art, and increase pedestrian traffic to a community. An Art Crawl is a great way to do this. Place temporary installations of art in local businesses and create a passport or guide that lists all the destinations. After a person visits all the locations, provide them with an opportunity to enter a give-away. Perhaps you have a drawing for a few memberships to a local museum or community learning center that offers art classes. Creating a community mural is an activity that can bring local residents together to create unity. Focusing on subjects or values that are shared among everyone like hope, friendship, nature or growth; or create a mural that documents the history of your town. Reserve a set of weekends where anyone from the community can volunteer to help paint the mural (with the supervision of campaign leadership). You could have local bands play during these volunteer days for entertainment. When the mural is finished, have a dedication ceremony and invite the whole community. Ask volunteers to share about their experience and what they enjoyed while participating in the arts. Create a sculpture walk using artwork from local sculptors or acquire a collection on loan. Find an outdoor space that accommodates a large crowd of people at a time and encourages movement. If there is a river, creek, or lake in your town utilize the shoreline as a path to follow for placing the sculptures. In this case, you could even partner with your local environmental group or club to organize and sponsor the event. No water? No problem. Place the collection downtown on a main street or through an arts district. Want to encourage interest in a lesser-traveled area of town? Try placing your collection along those streets along with food vendors and other entertainment. 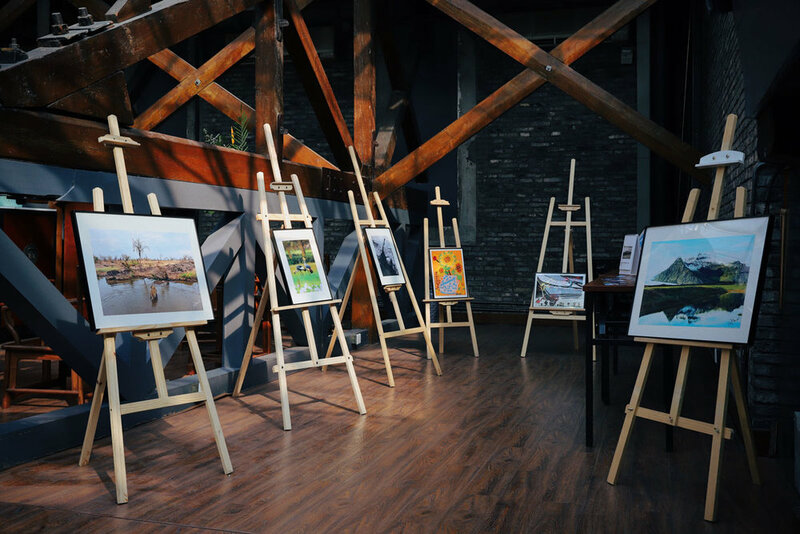 Reserve a community center space, event venue, party room in a restaurant, or put up a large tent outdoors to host a community art show. You could open this event up for entries from adults, local high school students and even children. Ask local eateries to donate appetizers for an opening reception and invite local musicians to perform for entertainment. Hosting an event of this nature creates an environment that encourages discussion between a wide range of generations, backgrounds, and interests. To bridge the generation gap even further, contact local assisted living communities to invite residents who are able to travel, or take a portion of the exhibition to put on display at the residency itself. Does your community have a talented glass blowing artist? Potter? Painter? Woodworker? Set up a series of demonstrations from artists to teach their trade. This could be done through a monthly event (ex: First Friday) or a week-long festival, or seasonal celebration (ex: "Fall in love with the arts this Fall"). This not only provides an opportunity for people to become more aware of types of art, but also gives local artists opportunity for publicity. You could even create pamphlets for each event that includes information about how to get started in that particular art form (ex: where to buy materials locally, trusted books from your local library, local artists, etc). By now, you can see how community art events can improve a community. You may want to learn more about how art boosts tourism to a town and creating business and art partnerships.